Mark your calendars to participate in our great summer savings event on Saturday, August 17 from 11 a.m. to 5 p.m.! Chase Ace Sale Tent – up to 50 percent off spinning prize wheel, free popcorn & balloons 11 a.m. to 5 p.m.
Join us for discounts, sales, demos, special events, food and lively shopping. The fun will stretch from downtown 4th Street to the West End Village. Downtown merchants and restaurants are gearing up to offer special items, entertainment and an opportunity to enjoy our lively community. 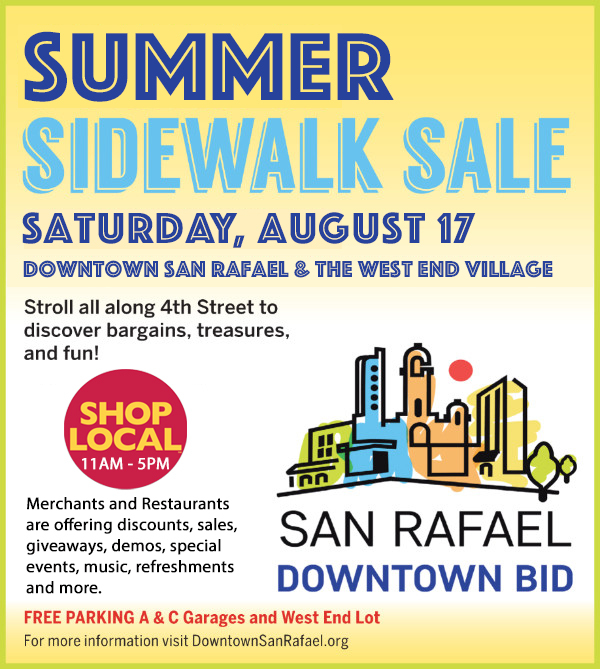 For more information, visit https://downtownsanrafael.org/summer-sidewalk-sale-sat-august-17-11am-5pm/.